Golf course views from the front balcony is one of the many outstanding features of this beautifully bright, 2 Bedroom/2 Full Bath condo. Situated in the unique On Top of the World community, it has been completely updated throughout; from floors to ceilings. Stunning neutral tile flows in each room adding to the airy spaciousness accentuated by recessed lighting in the dining room, kitchen, & family room. For a splash of European-inspired design, wooden ceilings in both baths & the dining room walls add rich flavor. The living room/dining room combo is highlighted by a large picture window. The brand new kitchen is impeccable; designed to maximize space. A striking tile backsplash is accented by new appliances/fixtures, accompanied by a versatile station offering storage & a built-in desk. Both baths boast luxurious floor-to-ceiling tile & new sinks/faucets, as their wood ceilings lend architectural interest. A large family room is framed by two windows & is ideal to host family gatherings. In addition to the new interior doors/storm door, new windows were installed w/ extended-width window sills to accommodate plants & décor. The master bedroom suite is well appointed with re-fabricated closets that include sleek drawers & built-ins. This entire subdivision is a realm unto itself with its 2 community recreation centers, golf courses, tennis courts, gym, bocce ball, horseshoes, shuffleboard, & wood shop; with a host of activities & organizations to join. You’ll feel on top of the world in this condo. Beautiful Florida sunshine fills this 800+ square foot home with natural light. 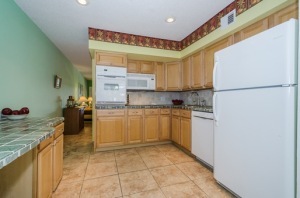 With one bedroom, 1.5 baths & a one car garage, this unit offers an extra half bath. Located in Palm Harbor’s sought after 55+ community Highland Lakes monthly fees of $266 contribute to your carefree lifestyle by covering the building’s exterior, cable, lawn care, roof, water/sewer & trash plus access to the sparkling community pool & beautiful clubhouse directly across the street. The adjacent dining area is framed by a striking picture window with a patio view, while the welcoming living room provides sliding door access to the tranquil Florida Room where a cool new tile floor & walls of windows make for a lovely refuge. The master bedroom boasts 2 walk in closets. Impeccably maintained both inside & out, the home’s exterior has hurricane shutters & was recently painted. Perfect year round or as a snowbird getaway; no pets allowed & the HOA requires ownership for two years prior to renting. 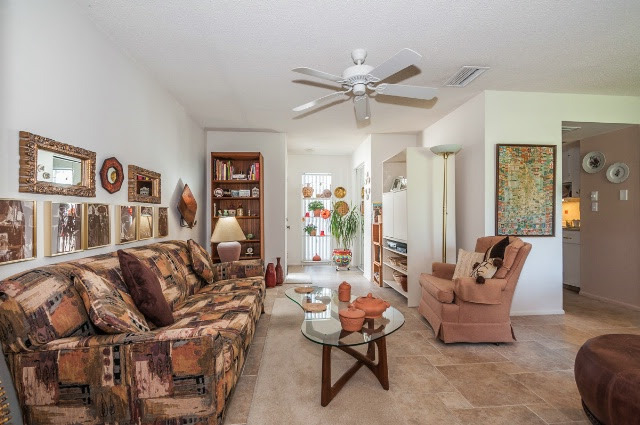 New tile flooring, new windows, new counter tops & sinks in the kitchen & baths, new hot water heater, new AC -2013, new washer-2014,new blinds in lanai.